Two days before the ninth largest economy in the world (and the largest South American nation) goes to vote in the first round of a two-round election, the world press pulled out all the stops. Brazil’s Mr. Jair Bolsonaro was warned for both by the Huffington Post and the Washington Post in screaming titles. Whereas South American stock markets have decidedly shown their trust in Mr. Bolsonaro’s election after a new poll showed him winning both rounds, the mainstream world media has not. This week reports in The Economist and CNN all failed to mention the large rallies held for him and only made a report about the women who decided to march against him. Related coverage: <a href="https://thegoldwater.com/news/38549-Brazil-Election-Markets-Jubilant-4-As-Datafolha-Poll-Predicts-Bolsonaro-Wins-Second-Round"> Brazil Election - Markets Jubilant (+4%) As Datafolha Poll Predicts Bolsonaro Wins Second Round</a>. Brazil, which has for years revealed in its image as a post-racial, left-leaning society is about to take a hard right turn. In the current state of world elections, this is nothing new. As from the 2015 Brexit election, pretty much every major democratic vote has been won by a rightwing candidate. But now Mr. Jair Bolsonaro, the rightwing evangelical outsider who claims to “love” US President Trump could be chosen to lead Latin America’s largest nation. Voters at Bolsonaro rallies seem to agree that after decades of corrupt and imprisoned politicians, Brazil is ready for a change. 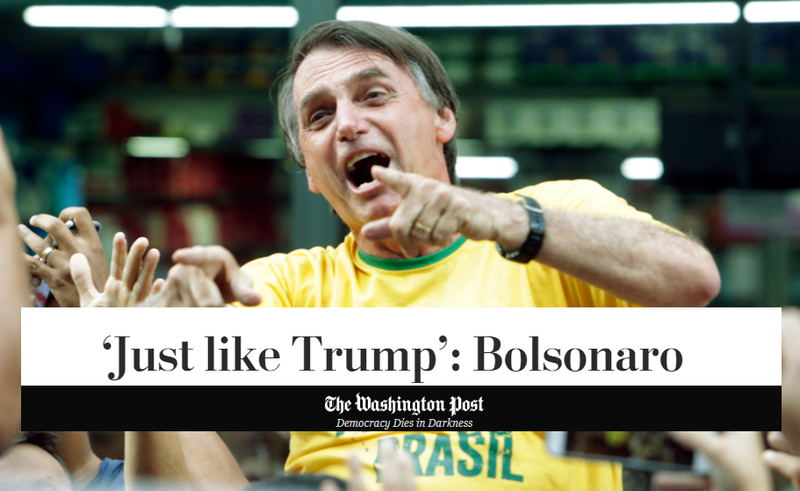 Mr. Bolsonaro’s has crafted his campaign on a similar style as Donald Trump, and critics now admit that this is probably what helped him. The support from youngsters online will normally see him win the first round on Sunday. Furthermore, at the start of the campaign, about a year ago, Mr. Bolsonaro was seriously underestimated by Brazilian pundits who laughed off his candidacy. After the two-round election this month, it could be that the former army captain will have the last laugh. President Trump is tightening his tie and ready to make some deals. GOD BLESS THE POPULISTS OF THE WORLD AND POWER TO THE PEOPLE!!! Gods grace & the way of the righteous is paving the road out for all these left wing deviants. Hey! Globalist`s! Good bye! Good luck & give the devil a kiss from me when you get there. 8-) Hardeharharhar!